Anyone used Potenza vs Chorus or Potenza vs Ultegra? Potenza is closer to 105 than to Ultegra/Chorus. Just to many "cut-off's". One clarification : Ultegra8000. If I have to choose between Potenza and 6800, Potenza without eyeblink. I just can't see any real life advantages of Super Record. This groupset just doesn't exist for me... No benefit from another 500bucks over Record. I have no knowledge about the new Campagnolo and Shimano groups you are talking about. All my components are now older than the dinosaurs apparently. 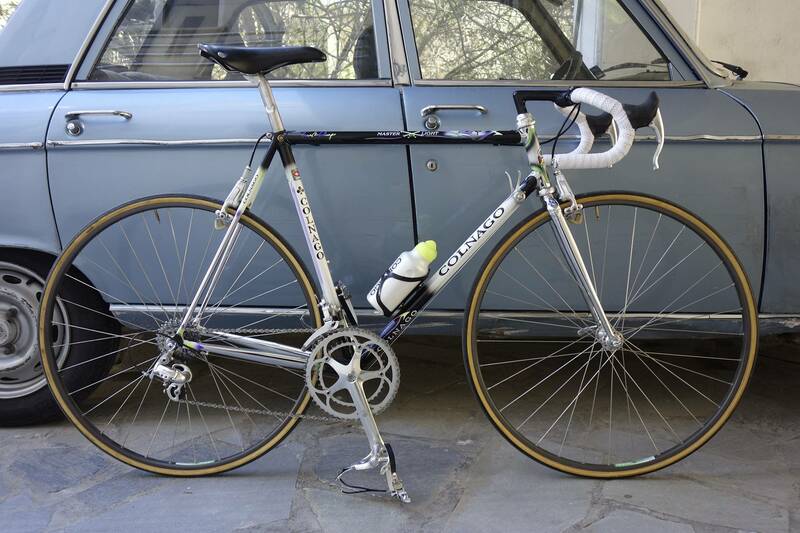 But I have multiple Campagnolo and multiple Shimano bikes. So I can offer a comparison of the companies at least. They both work perfectly. At least for 9 and 10 speed. No difference you would ever notice when riding. Veloce, Centaur, Chorus, Record on the Campagnolo side. And 105, Ultegra, Dura Ace on the Shimano side. They all work just fine for the past 20 years. There are appearance and weight differences. And maybe some can imagine and dream up speed or performance differences. Both shifting methods, thumb and lever with C, two levers with S, work great. So its easy to use both and switch between both at a moment's notice. Today I would recommend going with Shimano. Two tangible reasons. Shimano is dominant. Its everywhere. Easy to find every part on earth anywhere on earth. Every bike mechanic knows it. Campagnolo is only available from a few select shops on the internet and no bike shop mechanics have ever worked on or even seen it in person. Other reason is gearing. Shimano and SRAM make 11-32 eleven speed road cassettes. I think one or two other companies may make 11-34 or 11-36 road cassettes. Campagnolo is stuck on 11-29. So, much better mountain gearing with Shimano if you go with a double crank. Shimano does offer a triple if you ever want to do that. No triples with Campagnolo any more. Have to make some corrections. Apparently Campagnolo moved into the 21st century and now finally has or will have a 11-32 cassette in Potenza. Hopefully it will be slightly easier to find than the Hope diamond. And Athena still offers a triple crankset. So Athena along with Ultegra, 105, Tiagra, Sora, Claris all offer triple cranksets. I guess Campagnolo has not completely abandoned everyone who wants or needs low gearing on the road. But they sure try to hide and discourage it. Last edited by RussellS on Thu Aug 17, 2017 2:32 am, edited 1 time in total. Go with whichever brand's shifter ergonomics you prefer. That is really the only major difference as most groupsets within a given price bracket work equally well. RussellS wrote: Other reason is gearing. Shimano and SRAM make 11-32 eleven speed road cassettes. I think one or two other companies may make 11-34 or 11-36 road cassettes. Campagnolo is stuck on 11-29. So, much better mountain gearing with Shimano if you go with a double crank. You can get an 11-32 with Potenza. This year Campagnolo is coming out with medium cage derailleurs for Chorus/Rec/SR so you can soon get a 11-32 with those groups. I'm a Campy guy through and through though I have Sram on my Crux gravel bike and I've had Shimano on all my mountain bikes. I stay with Campy because it's beautiful and has jewelry like finishes though this is less so now that polished aluminum is out and black is the current fashion. I just find Shimano a little souless. I buy Chorus now because I don't think the $500 upgrade to Record or the $1000 upgrade to Super Record are worth the few Ti bits and ceramic bearings that you get for that money. You can take your Chorus group and install ceramic bearings for not much money or buy a few ti bolts. You could install some weight weenie brakes on Chorus, save the 100 grams and equal Record. Lots of options to save weight that are more cost effective. Would I ride Dura Ace if a bike came my way with it installed? Sure, no problem. I had an Ultegra bike a long time ago and I didn't think the quality of the metals was anywhere near Chorus. The painted finishes weren't attractive but Ultegra worked just fine though. I would just go out and test ride any bike with current Campy (although the shift action feel is slightly different between the groups but you literally have to ride them side by side). But the hood ergonomics was a key difference for me...that's why I bought the Campy Record 11sp just last year. I didn't like the look of it over my previous 10sp stuff but it just feels so much nicer in my smaller hands. Shimano always felt pretty good too! I will say Campy shifting gets smoother after 500-600 miles on all my Campy bikes vs the Shimano bikes are great outta the box. All the groups are all pretty nice what ever you choose. +1 choose based on hood ergonomics. DA9000. It just looks great. I might eventually put SRAM Red mechanical w/ EE brakes on my steel bike to save a couple hundred grams or so. as you have said, campy are pretty rare and trying to find Shifter to even just hold let alone on a bike will be hard. Chorus groupsets are currently selling for less than R8000 groupsets, at least on the UK websites. My vote is Chorus over Ult8000. I would have said it's a tie, but Campy levers are more comfortable. i have have or still have campagnolo and shimano 10sp and 11sp.